Local publisher and author, Tony Dierckins, wrote a piece in today's Duluth News Tribune that provides a nice historical background of Duluth's famed landmark, Enger Tower. Enger Tower sets prominently on the hilltop of Enger Park and often is compared to San Francisco's hilltop landmark. 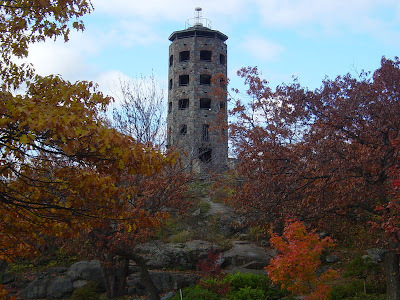 Enger Tower, as you may know, is set for some major repairs that will involve closing the tower during renovation. Te read Dierckin's piece, click HERE. Dierckin's X-Communications publishing house was the original publisher of my book, Cooler Near the Lake, and lis known for publishing works about area history. 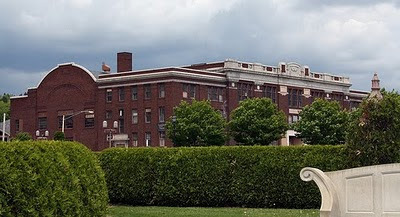 The apparent raison d’etre for saving the abandoned and decrepit Duluth National Guard Armory on London Road is that Buddy Holly performed there a few days before he died in a plane crash in 1959 and Hibbing High School student Bob Dylan was in the audience. At least that’s what supporters of saving the old building say when they attempt to advance their campaign. Their call. I’m ambivalent about the architecturally undistinguished building, even though, as I’ve written many times, I was there that night, too – the night 51 years ago three days before the music died. The Sunday (Jan. 17) Duluth News Tribune included a well-researched story by Brad Snelling, a librarian at the College of St. Scholastica, recounting that the famous composer Sergei Rachmaninoff, who was also a virtuoso pianist, played a concert at the Duluth Armory 90 years ago this week. No, I was not at that concert, but I was well aware of it. My mother, 21 years old at the time and a classically oriented pianist herself, often spoke of seeing Rachmaninoff in Duluth. And she spoke of seeing other world-famous artists at the Armory, most notably the great Russian basso Feodor Chaliapin and the Australian composer and pianist Percy Grainger. Until 1966, the Armory was the only sizable venue for such performances in Duluth. That all ended with the opening of the Duluth Arena-Auditorium (now called the DECC) in 1966, after which the Army National Guard also moved out of the building and it fell into ruin – the building we see today. But it did have its moments, some of them possibly more significant artistically than Buddy Holly and his fellow performers – the Big Bopper, a novelty act, and young singer Ritchie Valens, both of whom died with Holly in the crash of a small plane in rural Iowa. The Armory stage also served as a platform for numerous other notables in the arts over the years, including guests performing with the Duluth Symphony from the front ranks of artists of their day. And there were theatrical presentations, too, featuring well-known artists such as movie star Tyrone Power, Britain’s Dame Judith Anderson (see Hitchcock’s “Rebecca”) and others. In the late 1940s, a young tenor by the name of Mario Lanza gave a solo concert at the Armory literally months before he became a national phenomenon and movie star (“The Great Caruso”). I wasn’t there, but I do recall as a youngster that the town was up in arms over Bob Hope’s insult to the Duluth Armory. As they say, the truth hurts. The ranks are thinning in Duluth of people who actually attended events at the Armory. In the Rachmaninoff story it was pointed out that some 3,700 people were in the audience (the DECC auditorium holds about 2,400). They would have sat on row after row of wooden folding chairs. The armory auditorium was designed as a drill hall for soldiers, with a large, well-equipped stage at one end – huge velvet curtain within an imposing proscenium arch. The stage was fine; the hall was, well, Spartan. Or perhaps barn-like. Rachmaninoff, Chaliapin, Percy Grainger – all great artists of the past who graced the Armory stage. Buddy Holly, Ritchie Valens, Big Bopper, pop stars of the past, are the performers the building is remembered for. Oh, and also Bob Dylan, who did nothing more there than stand (there were no wooden chairs that night – it was a teen dance) in the hall with other teenagers, making it immortal in the minds of many. For some great pictures and more information about the Buddy Holly performance at the Duluth Armory, check out the buddyhollyonline.com link HERE. It's getting close to the anniversary date of "the day the music died" here in Duluth. Those of you who read this blog know that I was there at the Duluth Armory on January 31, 1959 for the Winter Dance Party Tour" with Buddy Holly and a crew of other promising musicians. Bob Dylan was there too. Local youth DJ (now local radio personality/executive) Lew Latto sponsored this memorable event. 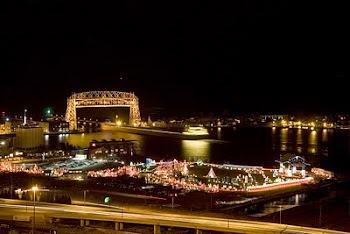 The Winter Dance Party Tour never reached completion when the plane carrying the performers, including Holly, crashed not long after leaving Duluth. The day of the plane crash has been memorialized in song as "the day the music died." Read more in my blog post written last year at the 50th anniversary of "the day the music died" in Duluth by clicking HERE. 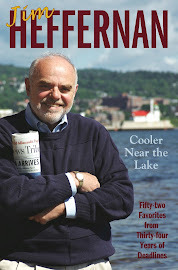 And click HERE to read the referenced newspaper column also included in my book, Cooler Near the Lake. Imagine my confusion on Sunday morning when, perusing the Duluth News Tribune, I turn a page and there is an ad I’ve seen over and over recently in the New York Times. I subscribe to both and briefly wondered which paper I was reading. The ad – and I’m talking paid advertising here – was for the current – and excellent – movie “Up In the Air” starring George Clooney. The only difference in the Duluth version was bold-lettered mention at the bottom that the popular film is showing only at the new Zinema theater in downtown Duluth. 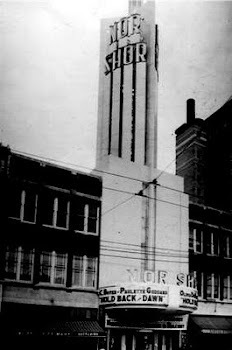 It’s across the street from the old NorShor theater which is now called a “Gentleman’s Club” featuring as its main attraction not-so-gentle women (live, on stage). Anyway, it’s been a long time since the Duluth paper has had the good fortune of somebody buying a full-page ad to promote a movie. The New York Times, on the other hand, publishes several such ads most every day. Movie advertising in the Duluth daily newspaper has been nil in recent years, with the dominant Marcus theater chain only listing the titles and times of its features in as small a box as they can get away with. Zinema 2, on the other hand, is locally owned by the interests connected with of the Zeppa Family Foundation. How they managed to secure a first-run, popular movie -- likely to be prominently mentioned at Academy Award time -- is a mystery to me, but certainly a feather in the cap of whoever pulled it off. Let’s hope there’s more of this kind of competition here. Many movies that show elsewhere – especially in larger cities – never make it to Duluth. Often they are highly praised by critics but do not contain the requisite car chases or vampires that attract large Clearasil-set audiences. I have seen “Up In the Air” at Zinema, sitting with a full house. It’s an entertaining and thoughtful movie that should appeal to any adult. And.. the Zinema is a first class small theatre recommended to any movie-goer. I guess I got out of the newspaper industry in the nick of time. I left when the Duluth News Tribune was under Knight Ridder and patterned itself in the tradition of the standard newspapers of it's day. When I was asked to continue my column at the DNT following my retirement as editorial page associate there in 2005, I did so under Knight Ridder and later continued through Forum Communications. My column was cut in June of 2008 and the changes at the DNT have have been monumental ever since. The whole industry is changing by the minute and now it's reported that some of the top people at the DNT are out of there. I hear too that 100 jobs in the copy desk and other departments are eliminated at the Strib (Minneapolis Star Tribune). All over the nation, these changes are happening. Click HERE for David Brauer (the Braublog) at MinnPost.com report on the DNT changes. Labels: Braublog, David Brauer, Duluth News Tribune, Minneapolis Star Tribune, Minnpost.com. Today is Elvis Presley's birthday. Had Elvis lived to a ripe old age, he would have turned 75 today. It's hard to imagine those swivel hips at the age of 75 though. Elvis was a giant in my generation and a genuine icon of our popular culture. I was privileged to have reviewed one of his concerts in Duluth not long before he died. Here's the link to that write up as it appeared on this blog not that long ago when the anniversary of his death was honored. Here's to Ol' Swivel Hips once again! I believe the turning of a new year is a good time to take stock in one’s life so far. Not just the last year, but one’s entire life up to this point. And it’s high time for me to face up to the fact that I’m never going to be president. That’d be president of the United States. I did make president of my church youth group as a teenager, but that’s another story. Even before that, when I was an actual small child, I believed them when they told us in school that every boy could grow up to be president (girls were not included then), and I counted myself in. But I became discouraged early due to those mean teachers who kept issuing report cards with mediocre grades. So it’s their fault that I never became president. Actually, that turned out to be a blessing in disguise, because years and years after I’d grown up I discovered that I was not born, or at least properly registered, just as an alarming number of Americans do not believe that Barack Obama, president of the United States and commander in chief of the U.S. Army, Navy, Air Force and Marine Corps, was born, at least on American soil. On New Year’s Eve, of all frivolous occasions, I received via e-mail a jubilant report that some California judge, who, the report took pains to point out “is a former U.S. Marine,” has agreed to take a case brought by people who challenge Obama’s right to be president because they believe he was born somewhere other than in America. The U.S. Constitution, of course, stipulates that to be president you’ve gotta be born on U.S. soil, unless you are Sen. John McCain, who was born in Panama, but never mind that. Obama’s Honolulu birth certificate looks fishy to people who did not vote for him and resent the fact that he is not only president (who gets to fill Supreme Court vacancies when they occur), but commander in chief of the above-mentioned branches of the armed forces. Association in some way with the armed forces apparently means a lot to these folks, often referred to as “birthers” when they occasionally get mentioned in the mainstream media because they challenge the validity of Obama’s birth certficiate. So now to me. As a full-grown adult, with all thoughts of being president cast aside, I discovered when applying for a U.S. passport that they didn’t have a first name for me when I was officially registered (it was in the time of Caesar Augustus), so they wrote “baby boy” where the first name ought to have been. Can you imagine how that would have played with a certain segment of the American electorate if I had, indeed, agreed to run for president had anyone suggested it, which no one did for reasons obvious to my early school teachers but not so obvious to the dozen members of my church youth group? Ah, politics. Former U.S. House speaker Tip O’Neil is said to have said, “All politics is local.” I wonder if they heard him right. Are they sure he didn’t say, “All politics is loco”?